Jaclyn and I have some bittersweet news. We are uprooting and moving to the Okanagan! I recently accepted a position in Kelowna, and will be on 101.5 EZ Rock for the afternoon drive show, along with a mid-day program that will air in many many markets across British Columbia! 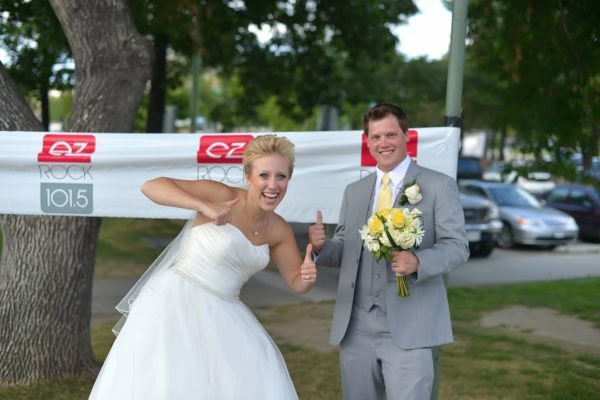 This is a station I’ve wanted to be on for a long time, and even on our wedding day, we snapped a quick photo with the banner in downtown Kelowna. Edmonton has been my home base for the better part of 20 years off and on, and Kelowna thankfully has been our home away from home! I am so grateful for all of the relationships Jac and I have formed, and we will miss you ALL, thankfully we will visit for holidays and such. Keppler is a solid guy, and a solid broadcaster! Congrats on the new role mate!